Harrison, Arkansas has often been associated with supporters of the Ku Klux Klan, but the city is working to bury racism. As CBS affiliate KOLR reports, the town held a number of ceremonies Tuesday night aimed at spreading the message of Dr. Martin Luther King. 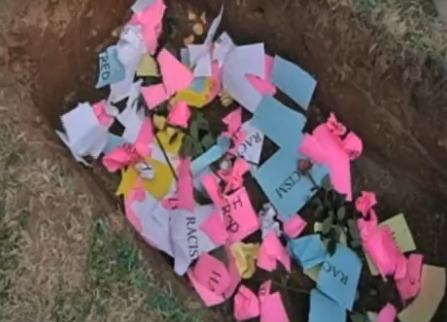 The ceremonies included literally burying a casket -- metaphorically burying racism. Decades ago, Harrison had signs warning non-whites to be out of town before dusk. But Tuesday at dusk, a peace march was held by people of all races to show that those days are over, the station reported. "We're a loving community, everyone gets along with everybody, and everyone accepts everybody," said Mayor Jeff Crockett. Crockett said even though the values of the majority of residents have changed, the town's image has remained tarnished, due to an influence from KKK supporters. "It hurts because people traveling through town don't know town," he said. "They don't know how we are." In order to change that perception, the town is holding a number of acceptance-driven ceremonies, including a candle-light vigil celebrating Dr. Martin Luther King's message and the burial of the casket. "What we want to do is bridge the gap," said Dushun Scarbrough of the Arkansas MLK Commission. "Allow these kids to be ambassadors of peace, give them an opportunity to share and love one another." Scarbrough told the station that the town is being held back by the influence of KKK Director Thomas Robb, who lives 15 miles out of the city limits. The KKK director said he's offended by the ceremonies' message and his side not being represented. "It's all about white guilt and it's all about white genocide," he said. Robb said the ceremonies have revived what he calls "100-year-old issues that have been forgotten," but Harrison's mayor said the symbolic burial of racism can change the town's image. "It won't go away, because if we leave it alone, the only voice that gets heard is the voice of the hate group," Crockett said.